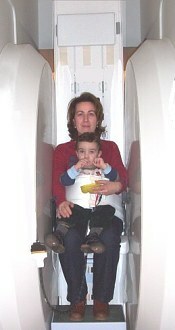 Specialist™, announced today that the Stand-Up™ MRI at Hospital de Madrid in Madrid, Spain performed in November of 2003 a historic “first” in the field of magnetic resonance imaging (MRI), by scanning an infant sitting on its mother’s lap. The scan was successful and the infant’s problem diagnosed. This is a remarkable event because it shows that the revolutionary Stand-Up™ MRI can possibly be used to avoid the use of anesthesia for MRI exams in a substantial percentage of children currently requiring it. 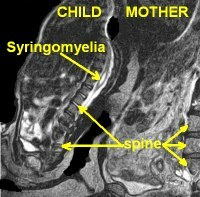 Fonar Stand-Up™ MRI scan of mother and 2-year old child with Syringomyelia, a disorder in which a cyst forms within the spinal cord. (elongated white area). MRI Specialist, Stand-Up, Upright, Position Imaging and PMRI are trademarks of FONAR Corporation.